0 Your Cart is currently empty. 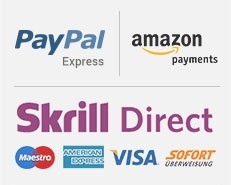 We charge a flat shipping fee of 4,50 € per order. From an order value of 60,00 € onwards, we deliver shipments free of cost. Unless otherwise specified in the quote, domestic delivery of goods shall be made (Germany) within 1 - 3 days, for deliveries abroad within 3 - 7 days from conclusion of contract (if advance payment agreed from the date of the payment instruction). Payment by invoice is possible from the second order onwards. Our company specializes in the delivery of high quality dietary supplements from German pharmacies manufacturing . We distribute the products of Vita World from Taunusstein . The product range includes orthomolecular substances (minerals, vitamins, trace elements, amino acids, fatty acids, enzymes, coenzymes) micronutrients, nutrients and phytochemicals . In our range you will also find organic produce and our popular medicinal mushrooms . We attach it to offer many vegetarian and vegan products special value .